Promotional Gift Products serve a plethora of purposes: brand promotion And recognition, sales incentives, event or concept advertising. The main purpose of the promotional gifts is to deliver a message that is Welcomed and retained. This message can be your company logo or brand, name recognition, annual meeting, corporate strategy, event promotion, etc. Corporate promotional gifts can be distributed at trade shows, conferences, corporate or shareholder meetings, speaking arrangements, client/vendor meetings, or via mail. The art of corporate promotional gifts is to communicate this message in effective and cost-effective manner. Personalization is a method of customizing promotional gifts to deliver The message. Most popular personalization choice is a company or brand logo and a tagline. Personalization choice is also determined by the size of the engraving area. If the size is limited, the personalization text should be concise in order to fit the engraving area. Larger promotional gift items such as clocks or large paperweights allow personalization and expanded verbiage. We recommend keeping your personalization concise; enough to communicate the concept you are trying to promote. Deliver a clever and powerful message that will impress your audience. The choice of gifts must be appropriate and in line with the message. For example, if you are promoting a brand or a service which is considered high-end, you want to communicate prestige associated with your service or product. Thus your promotional gift should communicate luxury, quality and status. It is also important to select an appropriate product to communicate your message. Remember that is not only the text but also the gift itself that is part of the message. For example, if you are a computer consulting company, imprint your logo and tagline on mouse-pads, leather CD cases, wrist-wrests. 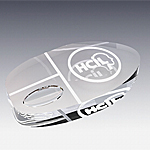 If you are management consulting firm, you may consider choosing a crystal desktop item as your promotional gift. While executing a promotional gift program, many often run in to Obstacles such as budget and delivery times. Do not expect vendors to produce and deliver your order last minute. In the best case scenario, you will pay excessive rush order premiums. Panning ahead is very important. To cover all bases one should select a preferred vendor and a back-up vendor and check product availability 2-3 months before the event. You can be creative even if you are working on a tight budget. For example: a security consulting company is trying to promote their newest product at upcoming conference. Their promotional budget allows them to buy 10,000 personalized mouse pads. They plan to distribute the mouse pads at the conference to all of the attendees. However, there will be at least twenty other companies giving away similar products. Thus the mouse pad gift will not make their brand stand out. After all, how many mouse pads does one person need? The unique idea is to opt for luxury gifts such as crystal clocks, but award them only to key people. In this case the key people are purchasing managers and media personal covering the event. After conducting research, the company sends out invitations to these key people accompanied by a crystal desktop clock with engraved logo and tagline. The gift is so impressive that the recipients feel obliged to accept an invitation for a presentation at the booth. Thus the attention was successfully captured. Moreover, after the event, the crystal clocks end up on a desks of the key purchasing people, subtlety reminded them of the brand, thus constantly reinforcing the connection to the product. This example demonstrates that you should carefully choose both the gifts and the recipients to make your promotional program effective. Some of the most popular promotional products are paperweights. Here, at Crystal Art USA we created a plethora of designs, shapes and sizes. The paperweights are truly versatile promotional gifts. If you are targeting a global audience, choose paperweights that feature globe themes. To communicate uniqueness and excellence, we recommend our . 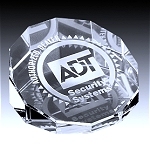 If you are promoting a brilliant product or a service, personalize our star or diamond paperweights with your logo. Apple paperweights communicate a message of learning, wisdom and expertise. In addition, numerous New York based organizations and event choose the apple paperweight design. Many real-estate and construction companies prefer our house paperweight as their promotional gift of choice. To promote a charity or a fund raiser, choose our heart paperweight. Or you may consider our top selling crystal paperweight designs: pentagon , cube, rectangle, mouse, star, crown. Products from our crystal desktop gift line are also widely used as promotional gifts. Crystal desktop clocks make a statement of distinction, quality, commitment to target dates, reliability. 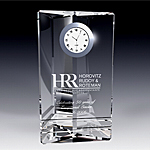 Our crystal clocks decorate many executive desks, conferences and boardrooms. Consider the publicity to your brand or logo generated by these high exposure items. In addition, we offer crystal pen holders personalized with your brand logo, which make an impressive and long lasting promotional gift. In conclusion, the possibilities for corporate promotional gifts are endless. Executing a successful promotional campaign involves making right choices of gifts and recipients and planning ahead. We hope that our expertise and our extensive line of crystal promotional products will make your promotional campaign a great success.